Slice all the jalapeños into thin rings. If desired, discard the seeds (leaving them in will result in spicier pickled jalapeños). 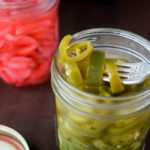 Pack all the sliced jalapeños into the dried mason jar, leaving at least 1/2 inch of head space. Pour the pickling liquid over the sliced jalapeños, making sure they’re all immersed in liquid. Cap off the jar and let cool a bit before putting it in the fridge. The jalapeños should be pickled and ready to use after a couple days, and will last for months when kept refrigerated!